What is dextrose and how to use it? Dextrose (grape sugar) is a type of carbohydrate that is a rich and healthy source of energy for your body. This simple carbohydrates have a high glycaemic index (GI), which means that it is very rapidly absorbed, and this is why it is used by bodybuilders and recreational athletes. Its main characteristic is to stimulate the rapid increase of insulin levels in the blood, and in addition easily transport proteins to each cell. The use of dextrose can be found in people who care about their appearance and the muscles before or after training. With grape sugar whey is a good combination, because together with dextrose it contributes to the development of muscles, as well as its maintenance. This tasty sweetener is very useful for the overall health of your body. It is known that its use is recommended for people suffering from hypoglycaemia. Dextrose is a useful addition to your diet, and we will tell you more about its use and where you can buy it. How do we use grape sugar in the diet? 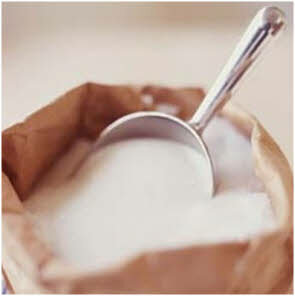 When it comes to the use of dextrose, it can be primarily found in many foods, especially in sweet dishes. In addition, people who have hypoglycaemia, the hospital can give a solution of grape sugar to them. In this way, their body receives the necessary amount of energy for normal functioning. Dextrose is the most common of all carbohydrates in the human body and as such represents a healthy source of simple sugars that will ensure that your body maintains an optimal levels of insulin in the blood. Therefore, its use is advised after severe physical exertion. Grape sugar restores energy reserves in all muscles, prevents their inflammation and allows the protein to transport them. It is important to know that grape sugar and glucose are not the same kinds of carbs. It is a monosaccharide that has a high glycaemic index (GI), which means it is easily absorbed by the body and transported to organs and cells. Sources of dextrose may be natural (wheat, potatoes, prunes, dates, apricots, corn starch) and artificial (obtained via the industrial processing of glucose). Since it is a carbohydrate, dextrose contains a significant amount of calories, so 100 grams of sugar contain 375 calories. On the other hand, protein and fat are not in its composition, but they must be compensated by using other additives and compositions. However, this should not be a concern if you are a physically active person, because in this way calories distributed through your body and your muscles will be easy to burn. We'll share with you an interesting fact when the use of dextrose before training is in question. In fact, if you consume 100 grams of grape sugar, for its complete consumption and burning you need to run 9.7 km in half an hour, or swim in a slower pace for 53 minutes or skip rope for an incredible 31 minutes. Therefore, you should be aware that the use of dextrose before training is justified only if it comes to a more intense and physical effort. Professional athletes who visit the gym regularly use grape sugar to achieve the desired results. The great advantage of dextrose as compared to other sugars is that it is easily digested. It does not burden the digestive system and causes a feeling of bloating and the characteristic inertia, which can often be a poor excuse for skipping workouts. Bodybuilders therefore opt for creatine and dextrose during their training, because together they are easily synthesized in the liver, pancreas and kidneys. In this way are transported to the muscles, giving them the energy needed to withstand the loads and the efforts during training. The best results are achieved by adding protein to this combination and dextrose and whey are an ideal combination, and it is a common knowledge how the amino acids of this dairy product are important for the proper functioning of muscles. Dextrose after training primarily contributes to easier and faster muscle recovery. It also prevents inflammation, and as it stimulates insulin secretion it allows you to feel satisfied, rested and healthy. It is therefore advisable to use a grape sugar after exercise, and the best thing to do is to take 20 grams, stir it in a glass of water and drink. Hypoglycaemia is now increasingly becoming a common disease, which results in low blood sugar levels. Many diabetics suffer from this health problem and its causes lie in skipping meals, irregular and improper diet or taking medicines that have an exhausting effect on the body. The consequences of hypoglycaemia are reflected in the feelings of fatigue, hunger, irritability, uncertainty, anxiety, often dizziness and difficulty in concentrating. If you experience any of these problems, we will tell you that dextrose diabetes can simply be beaten by consuming this sugar on a daily basis through beverages and foods. Its use is advised for those who have blood glucose less than 70 mg / dL, because grape sugar will help the liver secrete its own insulin and transport it through the body. It is enough to take about 15 grams of carbs, dilute them in a glass of water or tea and drink it on an empty stomach. Besides being rich in carbohydrates, which provides energy for the body, dextrose does not contain fat, which means it may be suitable for those dieters. The lack of lipids means faster absorption by the body, but also it helps all the nutrients to digest easier without burdening the stomach and intestines. Grape sugar is a great protector of the body against heart diseases because it does not contain saturated and trans-fatty acids. This carbohydrate contains no sodium, which can be useful because it does not lead to accumulation of water in the body. On the contrary, the use of dextrose will help eliminate excess fluids, which will regulate your weight. Therefore, you will avoid the risk of a high blood pressure, as grape sugar contains no cholesterol. What is the price of dextrose and where to buy it? It is a very affordable product, so dextrose can be bought in all health food stores and well-stocked supermarkets. In addition, it is possible to order it via the Internet through authorized distributors of supplements for bodybuilders, which significantly simplifies its procurement. The price of dextrose is about 5 dollars for a pack of 1 kg, which is certainly very convenient. What foods contain grape sugar? Dextrose can sometimes be found in various foods, primarily as a sweetener. Therefore, it is usually present in small cakes, juices, sweet sauces, candy, energy drinks and ice creams. In addition, it is in some salty foods, for example canned food, pretzels, pickles and crackers for diabetics. Interestingly, the grape sugar is used in a variety of meat products, it can also be found in meat products such as sausages and ham. If you want to know which foods contain dextrose, it is necessary to carefully read the ingredients on a declaration. It is usually marked as D-glucose, rice, corn or wheat sugar. Does the grape sugar have side effects? Intolerance to dextrose may occur in some people, and often in the form of acne, pimples increased greasiness of skin, head and face. In some cases, there is also an increased urination, redness of the skin, and in severe cases, difficulty in breathing, swelling of the mouth, confusion, muscle cramps and dizziness. It is therefore necessary to be vigilant and use it with prior consultation with your doctor. Women are advised not to consume more than six tablespoons a day, while for men the limit is no more than nine scoops per day. If the dextrose is used without regular physical activity, it is very easily convert into fat tissue. This results in weight gain, and can lead to low immunity. In elderly people, dextrose may increase the risk of heart disease, stroke and even Alzheimer's disease. It is therefore important that the dextrose is used only by those who are regularly engaged in some physical activity, because that is the only way to take advantage of all its benefits.